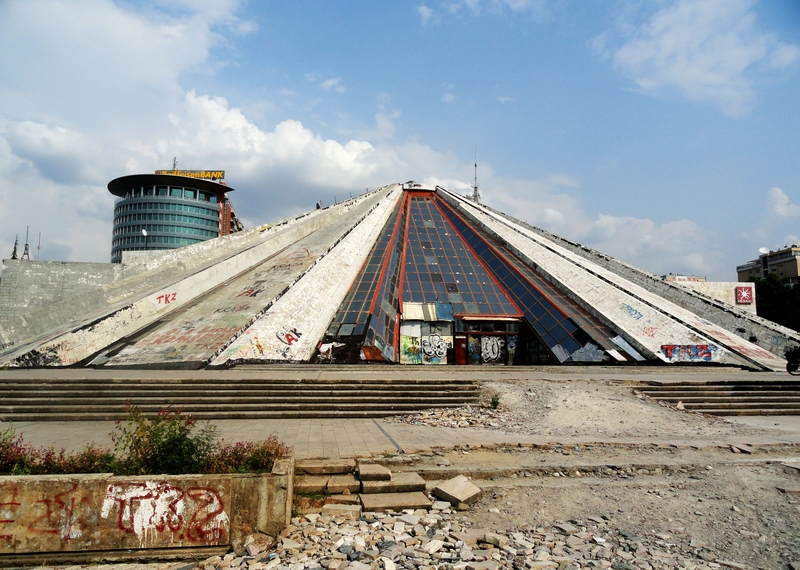 The Pyramid in Tirana. Photo © Eno Shkëmbi. By Decision of the Council of Ministers (VKM) yesterday, the ownership of the “Pyramid” in the center of Tirana, officially known as the Arbnori International Cultural Center was transferred from the Ministry of Culture to the Municipality of Tirana. The Pyramid was opened on October 14, 1988 as the Enver Hoxha Museum. Since 1991 it has functioned as night club, television studio, and occasional exhibition space. A project to renovate the interior of the Pyramid, and equip it with a theater room and proper exhibition halls remained unfinished. In 2011 it was threatened with destruction, after the Berisha government decided to construct a new parliament on the same site. The transition of the property from the Council of Ministers to the Tirana Municipality also makes the modification, restoration, or destruction more easy; such decisions no longer need to be taken by the government as a whole, but now fall under the responsibility of Mayor Erion Veliaj.